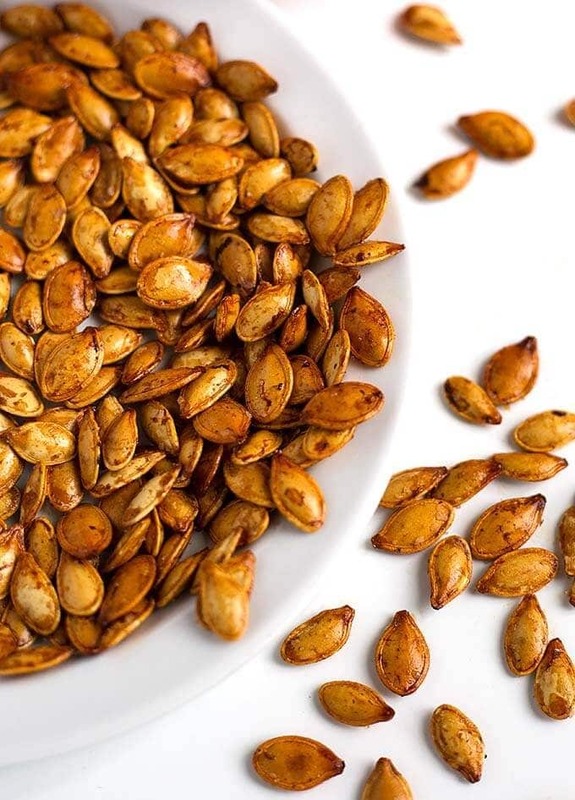 Learn how to make Roasted Pumpkin Seeds that are crisp and tasty. A fun and healthy snack. We enjoy them with different flavors, and this method works with all squash seeds. Roasted squash seeds are such a great treat! We love the Fall! Halloween is a fun holiday for us as we get to carve the pumpkins! That’s when we head out to Bob’s Pumpkin Patch to pick the perfect pumpkins (They have excellent corn, too)! I like the carving, but not so much scooping out the innards and seeds! But I do it happily as I know we will be making Roasted Pumpkin Seeds! 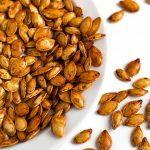 It may not seem like you would need a recipe for how to make Roasted Pumpkin Seeds because it looks pretty obvious. Put the seeds on a pan, add salt, and roast! You can certainly do that if you wish, but what if there was a way to get crisp roasted pumpkin seeds that didn’t turn out slimy and unappealing? First dry the pumpkin seeds in 300° oven. This helps the butter or oil stick, and yield a crisper batch. Next, coat the seeds with butter or oil. Not too much. Add the salt and/or any spices you want to use. Back when I was a kid, we would take the seeds out of the pumpkin and put them on newspaper. Then we would get as much slime off as we could. After that we would put them on a baking sheet and roast them at 350° until they browned (or burned). That was a terrible way to make them, and they were not very good. Being kids we ate them anyway, haha! It took some trial and error to get this recipe to produce nice crisp pumpkin seeds that tasted good. I hope you enjoy making them as much as I do! 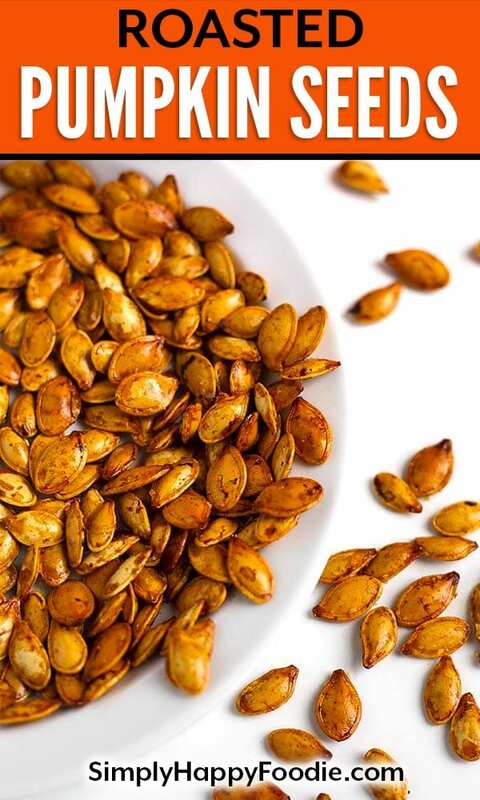 Roasted Pumpkin Seeds are a tasty and healthy snack. We enjoy them with different flavors, and this method works with all squash seeds. Roasted squash seeds are such a great treat! Rinse them in a strainer, shake them to get most of the water off, and spread them out on a baking sheet. Put them into a 300 degree (F) oven for 15-20 minutes to dry. Take out of the oven and toss with olive oil or butter, and salt and/or spices or your choice. Put them back in the oven at 300 degrees (F) for 15-25 minutes, stirring occasionally, until they get golden brown. 1. The trick to perfectly roasted pumpkin seeds is a low oven temperature. 2. Drying them before adding the butter and roasting ensures a crisp pumpkin seed that will have the perfect crunch! I tried this with spaghetti squash seeds and it worked! There were really good. I like that the seeds didn’t go to waste. Thank you for the recipe. Cool! I love it! Thank you for letting me know! I drained them, then continued preparing the pumpkin seeds as per your instructions. YUM-O TO THE MAX! !